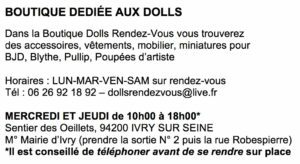 Our association, Rêver & Créer, Miniaturists-Creators-Collectors, aims at making known, develop and promote, in France and abroad, miniatures and collectible dolls. Rêver & Créer also allows creating links between its members and other miniaturists to increase the number of people sharing this common passion. The members of this association are collectors of diverse miniatures, and dolls of artists- creators.